Welded cabinet with removable covers, prepared for the installation of independent air-conditioning units, IP54, capacity 400 kg. Wiring inputs in the upper and lower parts are 300 x 100 mm in size and are sealed by blanks. Included with the cabinet is one multiple wire bushing with high protection coverage. Large ceiling breakout panels allow the installation of air-conditioning units with the airflow directed exactly as required. Installation of air-conditioning lowers the IP protection of the entire system to IP20. For more information see the section Active Cooling. RIE series cabinets with increased protection are intended to protect the equipment particularly from harmful effects of water and dust. Ceiling perforations do not reduce the impermeability of the cabinet. The side covers are bolted to the frame and the same as the door, have a foam seal. The covers have holes which allow the cabinets to be joined together. 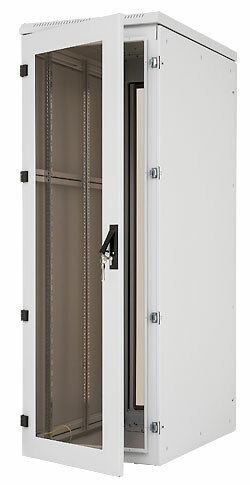 Lock with a sliding locking system ensures a perfect door seal with the cabinet frame. The system is compatible with handles and locks of all major manufacturers including electronic and coded. For cabinets deeper than 800 mm, the two pairs of fully adjustable 19” vertical rails are supplemented with a third pair of middle rails. We use a 3D robotic workstation for the glass gluing and foam sealing. All removable parts of the cabinet are connected. There is M8 screw to connect the bonding on the back wall. Marks for setting the vertical rails on sliding rails simplify the installation. • Cabinet includes 4 sliding vertical rails for device mounting (6 rails for cabinets deeper than 800 mm). – Single door sealed by foam gasket in all metal versions or glazed with safety tempered glass 4 mm. They can be on the front or back of the cabinet. 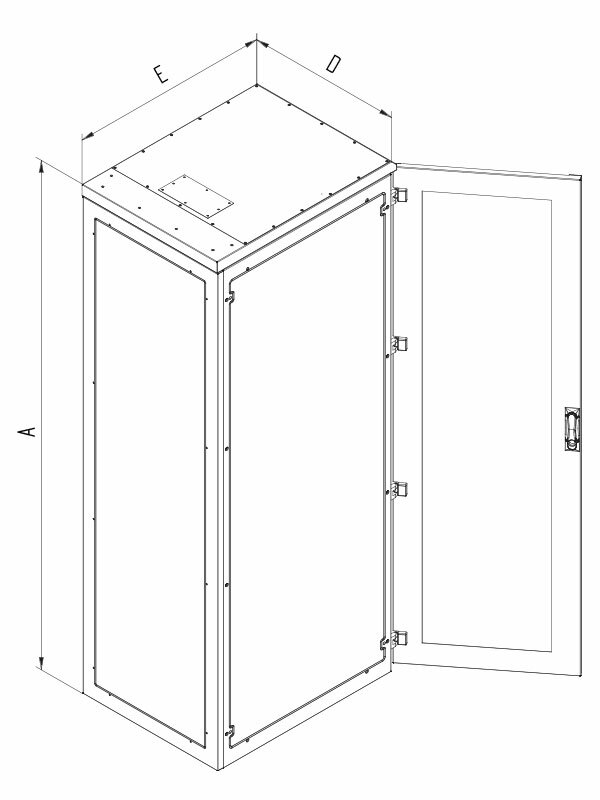 To achieve needed protection the doors with 3-point locking system are standard for this model. • Max. permissible load of the door is 20 kg. • Min. thickness of the surface finish is 65 µm. 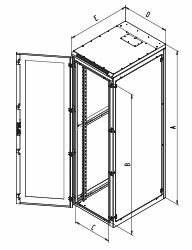 • These cabinets are intended for installation of data and telecommunication devices and their distribution systems. 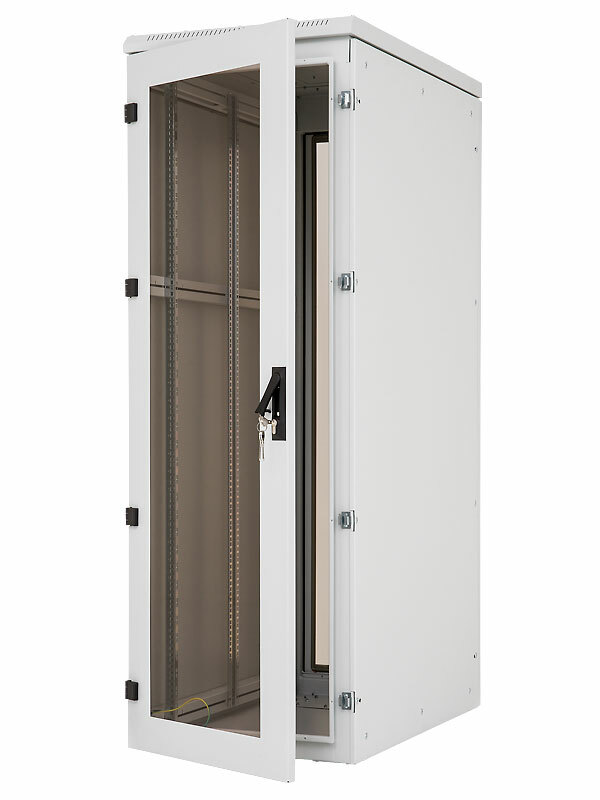 • The frame of the cabinet and all the removable parts (side and rear covers, doors…) are bonded with patch cables that have to be properly fixed and inserted into connectors throughout the period of use of the cabinet. • There is one M8 screw placed on the bottom part of the cabinet to connect the bonding. 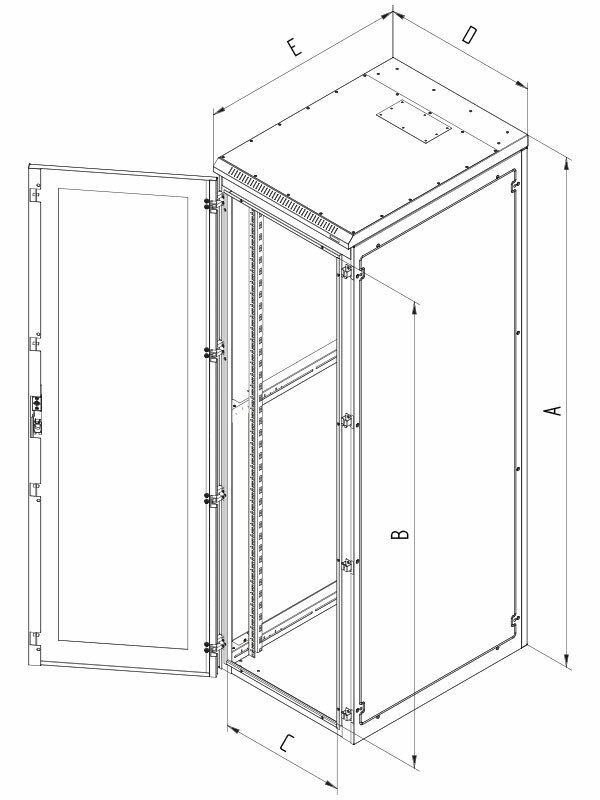 • Cable openings placed in the top and bottom part of the cabinet are secured by dismountable blanking panels. – The cabinet is not intended for outdoor installations and for installations in environment that can influence negatively the functionality of the cabinet and the mounted devices (e.g. environment with danger of explosion). – A different usage than the cabinet is intended for. – Overloading (exceeding the maximum recommended load). – Installing devices which may negatively influence the operation and function of the cabinet or the installed equipment. 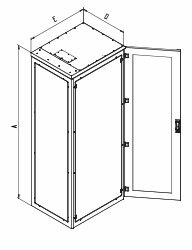 – Change of the construction or design of the cabinet. • To ensure the maximum recommended load, it is necessary to distribute the load equally. • Place the cabinet on a flat floor and adjust any differences using the levelling feet. • To avoid dust penetration in the case where cables lead through some of the cable openings, it may be sealed with a blanking panel with a brush or secured by a plastic frame (both are included in the delivery). • This product is fully in accordance with ČSN EN 62208 ed 2:2012.